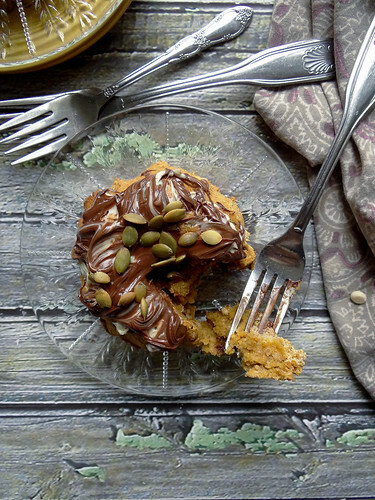 this is the time to indulge in pumpkin everything- that is of course if you like pumpkin. 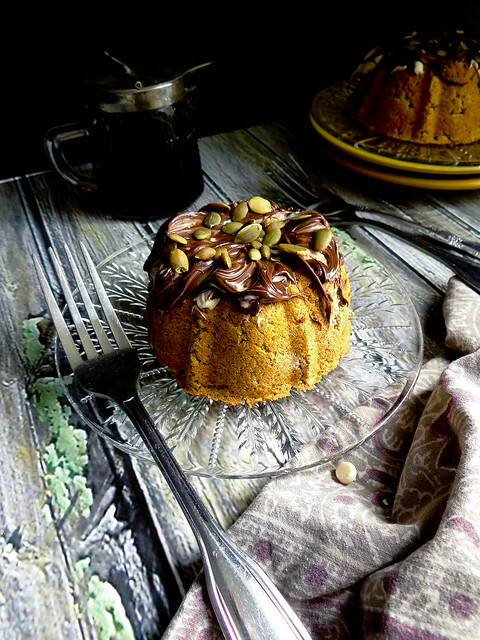 everywhere you turn you are bound to see loads of recipes inspired by the mighty fall pumpkin - some savory, some sweet; pumpkin puree, pumpkin pie filling and fresh pumpkin all find their way into most recipes this time of year- and i love it. 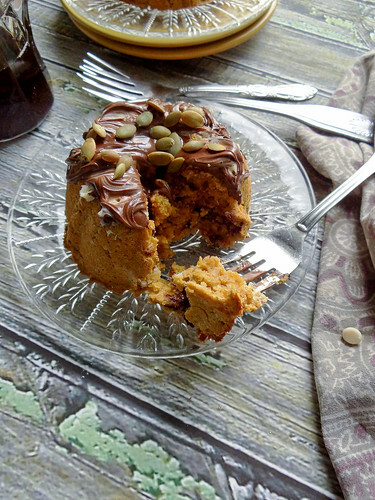 this has been one of the tastiest gluten free cakes i have ever made - so moist and flavorful. 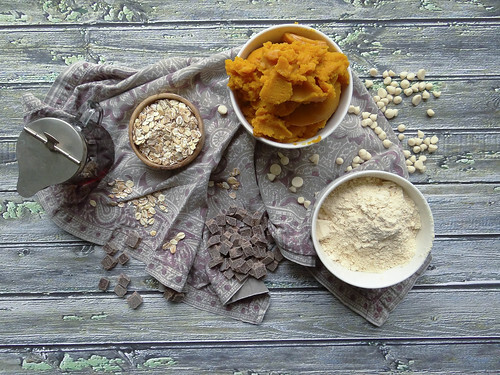 gluten free oats are finely ground then combined with coconut flour (love coconut flour! ), chocolate chunks, pumpkin puree and maple syrup. all the autumn goodness you could ever want in one bite. the mini bundts are baked - they actually bake up pretty quickly, in about 20 minutes or so. then drizzled with vegan white and dark chocolate sprinkled with pepitas for the finishing touch. not only super tasty but beautiful, vegan & gluten free making any guest at your autumn table smile. 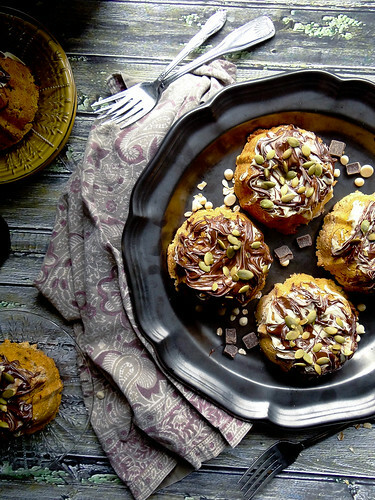 one thing is for certain, these beautiful chocolate pumpkin mini bundts will absolutely be finding their way to my annual thanksgiving dessert table. do you have a favorite pumpkin recipe you always make when you spot that first sugar pumpkin at the farmers market or can of pumpkin at the store? 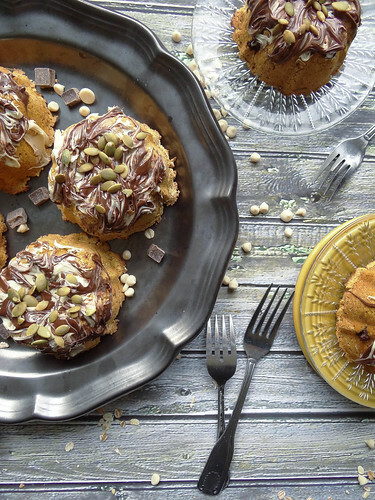 have you had luck with gluten free baking - what is your best gluten free dessert recipe? 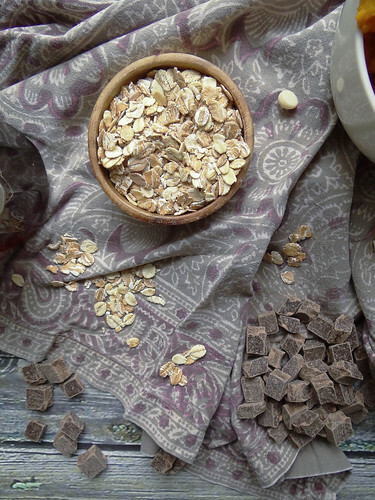 in a medium mixing bowl combine dry ingredients (gf oats through cinnamon) - stir in chocolate chunks. in another medium bowl combine wet ingredients - pumpkin through maple syrup & whisk until well combine. stir wet mixture into dry until well mixed. 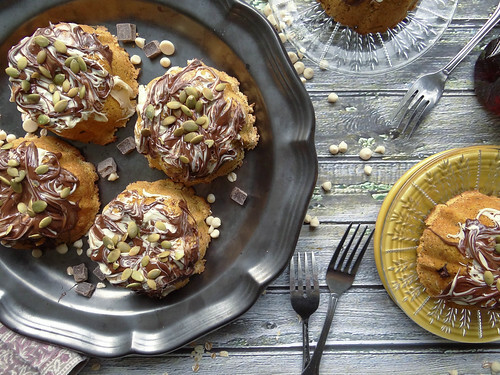 grease a mini bundt pan (6 mini bundt wells) with canola oil, coconut oil or vegan butter & lightly flour with coconut flour, tapping out the excess- fill each mini bundt well with pumpkin mixture. bake in the oven for 15 - 20 minutes until a skewer comes out clean when tested in the center of the cakes. remove from oven and allow to cool on a wire rack. turn out once cool enough to handle pan. 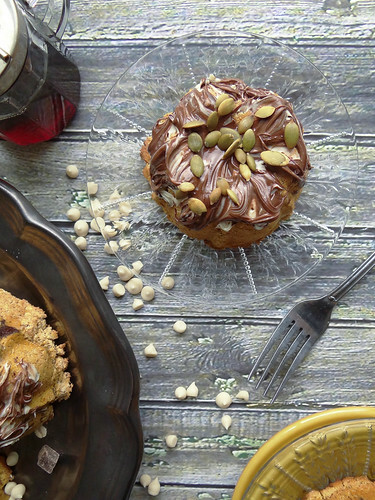 drizzle melted chocolate over the tops of each cake and sprinkle with pepitas. The picture overload is totally comprehensible--these photographs are simply gorgeous! Wish I could just grab a mini cake through my computer screen. Awww thank you! The cakes were super tasty too, I can't wait to make these for Thanksgiving! You two are amazing - homemade pies from the pumpkins you grow - so incredible! these are gorgeous. you are an artist. ps. how did you end up visiting my blog today.... I see a hack - did you see it ok? What browser are you using? xo Ella. I am using internet explorer....I tried to link up with your pumpkin post and it wouldn't allow me too - that was the only thing that was off...oh no a hack - that doesn't sound good at all! another gorgeous creation. 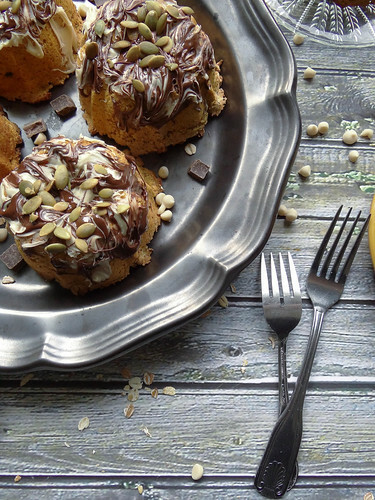 i bet the pumpkin and chocolate work so well together.. and i love all things mini! gorgeous pictures Heather! Thanks Richa! Sometimes I go on a mini overload, but mini's are so cute I can't resist! I haven't had much success with gluten free baking, you make it seem so easy! 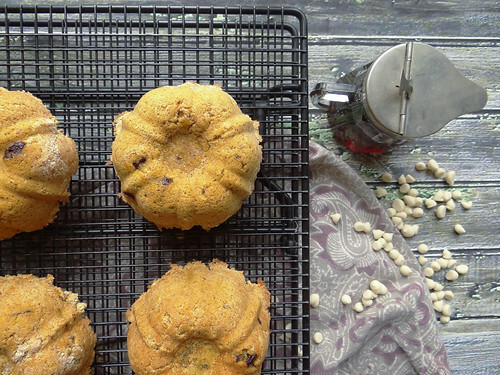 Looks like I need to try out the coconut flour :) Those are so beautiful Heather! You definitely need to try out coconut flour- love the stuff! You are just so talented I can barely stand it! These little cakes look delicious and absolutely stunning! Especially that swirly chocolate at on the top- simply amazing, Heather. You rock! Okay you are making me blush here Kristy...if only you lived a little hmmmm alot closer you could taste the amazingness! 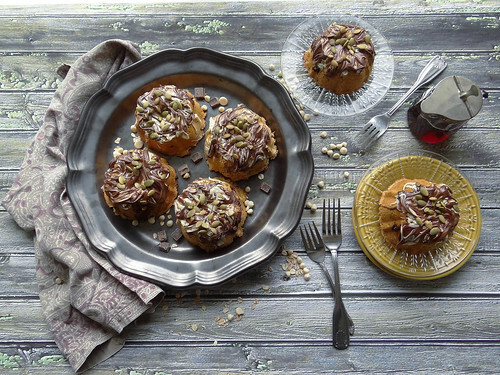 Ok I think you may have just convinced me to buy a mini bundt pan! We had mini bundt cakes at our wedding reception and I just think they are adorable. 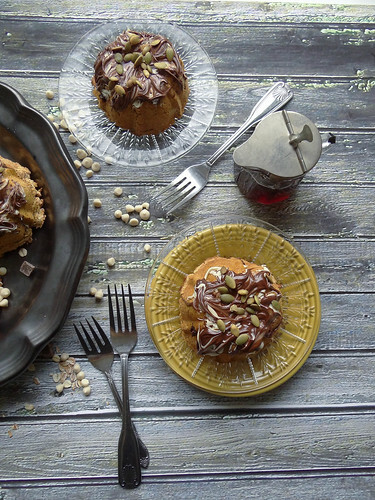 I need to make some of your amazing looking bundts! Beautiful! Yum! I will probably need to try this out. 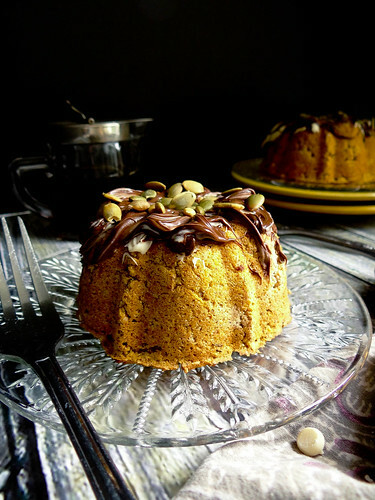 I am obsessed with pumpkin and chocolate and haven't broken out my mini bundt pan in a few months! I have had a bit of success with gluten free baking. I definitely love oat, rice, almond, and coconut flours. Not a huge fan of bean or quinoa flours though. I am with you on the GF flours - I have had a few success with Chickpea Flour but I love GF oat & coconut flour along with almond meal! The flavor was so good - these were dangerous to have in the house all to ourselves! Looks awesome! I would so love to try some. Awww thanks Court! The chocolate topping was pretty Kickin' I loved the pumpkin and chocolate together! These are kinda like you Uru- sweet & cute! I always try to come up with as many ways as I can to use up canned pumpkin during this time of year! 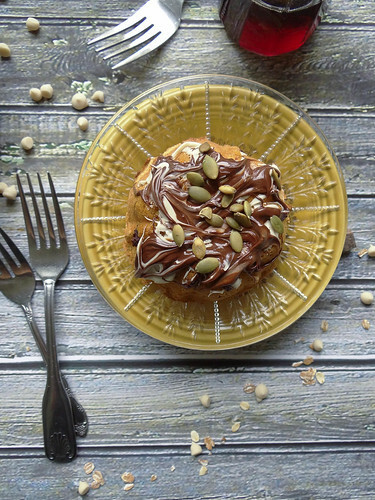 I don't think you can go wrong with any pumpkin baked good that has maple syrup and cinnamon in it. 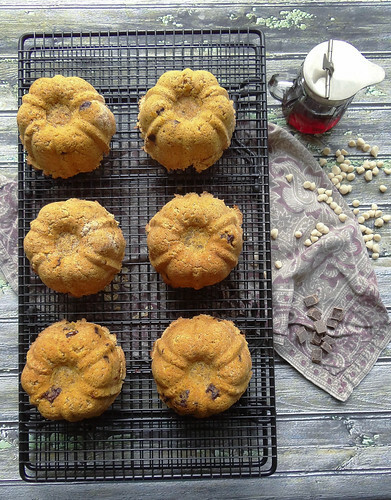 Love that you used oats and coconut flour too! Just a note - I think our pumpkin can sizes in Canada are bigger than the U.S. ones...what size can did you use for your recipe? These are so adorable! I love mini anything. 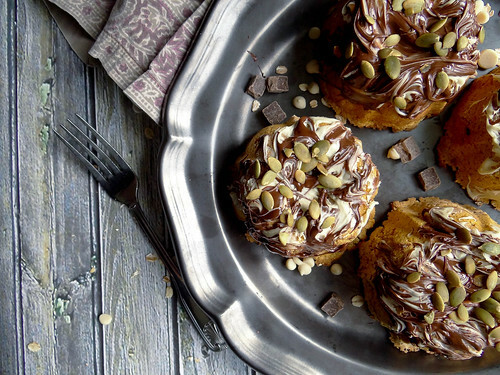 Plus the combo of chocolate and pumpkin? To die for. Thanks Lauren - me too, mini's are awesome!